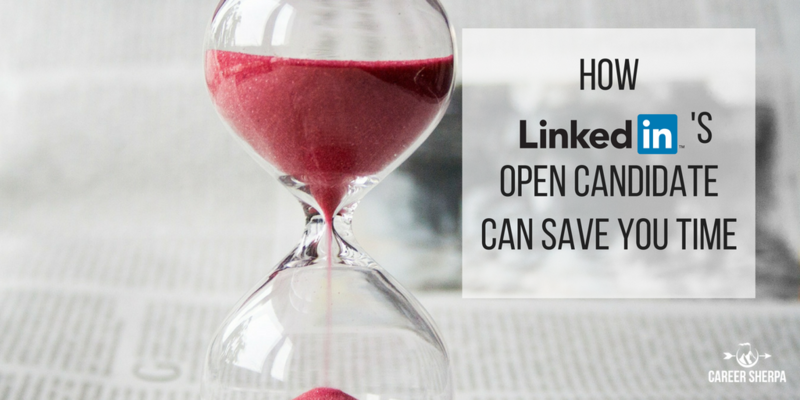 If you are tired of your job and ready for a change, then you need to know about LinkedIn’s Open Candidate function. Here’s the problem- searching for a job is time-consuming and hard to do well when you are working a full-time job. As a result, you may find yourself trapped in a job you dislike longer than you want because you don’t have enough time to invest in a thorough job search. Sure, less time-consuming job search methods exist, but generate dismal results. For example, it doesn’t take long for you to post a resume to a job site (or two). The fact is- recruiters prefer NOT to search posted resumes unless they’re desperate or have a very specific set of skills they are looking for. They don’t know what they are getting and it is overwhelming to search resume databases, so it’s seldom the primary source for identifying candidates. The other trap all job seekers fall into is wasting time searching job boards and applying to any job that may look interesting. It isn’t unusual for working job seekers to send a generic resume and cover letter. This shotgun approach results in less than 15% of hires, according to the Jobvite Index, which aggregates source of hire data from 2007 to the present. One of the biggest problems with searching for a job while employed is that you run the risk of your current employer finding out you are looking for a new job. Even talking with people in your network about your quest for a new job could get back to your boss if you aren’t careful. Imagine if you could secretly let recruiters know that you’d like to be contacted about new opportunities. This might increase your chances of a recruiter reaching out with an amazing opportunity. Now you can. LinkedIn released a new service called “Open Candidates” which enables your LinkedIn profile to indicate you are open to new opportunities. Only recruiters subscribing to the recruiter tool on LinkedIn can see this. Recruiters at your company or affiliated company recruiters will not be able to see you are open to new opportunities. Remember: Keep your job search confidential by reminding your network to keep your search private. Another benefit to the Open Candidates feature is that you can specify the job titles and industries you are interested in and the geographic locations you are open to. A major frustration has been that job seekers couldn’t specify more than one industry. They also didn’t know what city to list in their profile if they were interestedin relocating. To activate your preferences in Open Candidates, on your home page go to LinkedIn Jobs. In the pull-down menu select preferences. It isn’t enough to hope that recruiters find you. You have to proactively target companies that seem like they would be a good fit. This requires you research each target company and find people you can talk to. But let’s say you just happen to hear about a job (of find in on a job board) and want to research the company. This typically requires using multiple sites and even then, you aren’t sure the information you’ve read is accurate. Yes, you’ve always been able to research companies using LinkedIn. But now, LinkedIn makes it easier through their newly released “Career Pages“. Companies will be able to provide an overview section, relevant jobs and more insight on corporate culture. Companies will need to pay to incorporate long-form written posts, photos, leader profiles and aggregate data on company and culture. 30 companies successfully piloted this employer branding and research feature and LinkedIn has decided to roll it out. Expect to see more career pages as more companies learn about it. These additional features should save you a lot of research time. You’ll also get a 360-degree view of the company to help you understand what it will be like to work there. Career Pages will also include even more valuable intelligence for job seekers. When you are on a company’s career page, you will see job recommendations tailored specifically to you. You’ll also see a section called “Meet the Team” which shows information about people in similar roles in the company. You’ll see the job the person came from, their skills and the school they attended. As you look at this information, you can compare your skills and career path with theirs. You may also find that you attended the same school, which you can use during the interview to build rapport. If you are employed and searching for your next job, take advantage of all the resources available to you. LinkedIn’s newest features should save you time, provide meaningful insight and allow you to easily identify people you know inside companies. This will help you can get the inside scoop and a leg up on the competition for the job. Remember, referred candidates are the number one source of external hires. Learn how to get referred!